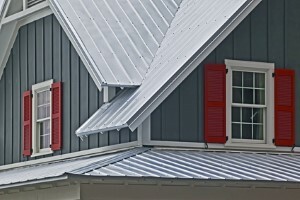 Opting for metal roofing can be quite beneficial for both homes and businesses. The Roof Maker, Inc. offers the best in quality roofing materials as well as skilled installation. Since 2009, our company name has been the one locals turn to for quality workmanship. However, our experience in the industry spans back to cover much more than just that decade. The lifespan far exceeds traditional shingles. While the upfront investment is higher, the trade-off is better longevity. Metal roofing has an average lifespan of about 50 years but can last as long as 70, with the right maintenance. There are many reasons this roofing material is considered “green.” However, the fact that it is completely recyclable at the end of its life cycle is one rationale for being able to label it Eco-friendly. Metal roofing is fire resistant which can make your home safer, as long as it is placed over material that is resistant. In fact, this type of roofing even reflects heat well, reducing the impact direct sun would normally have on the home, such as utility costs for cooling in the summer. For the best in service for your metal roofing system, contact our team of experts to get the job done.